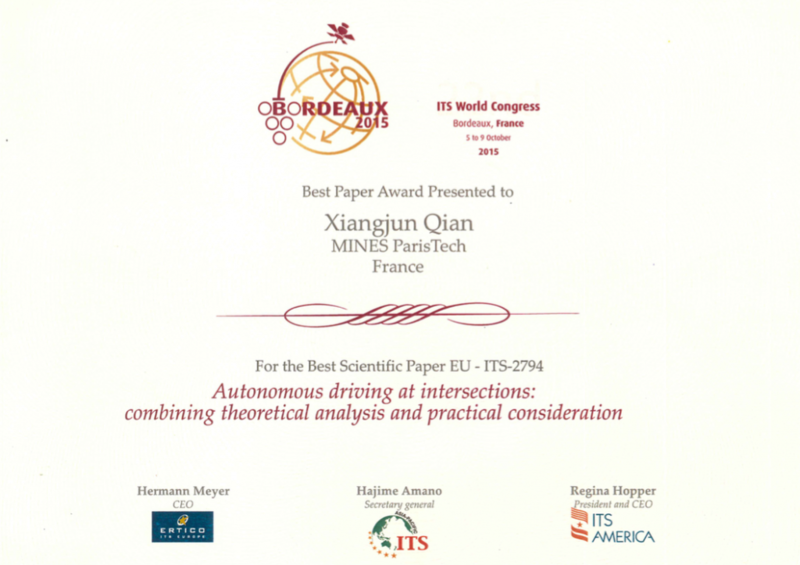 L’article « Autonomous driving at intersections: combining theoretical analysis with practical considerations » a remporté un Best Paper Award lors du ITS World Congress 2015 à Bordeaux. L’article a été écrit par Arnaud de La Fortelle (Directeur du Centre de Robotique et titulaire de la Chaire Drive for All) et Xiangjun Qian (doctorant au Centre de Robotique) dans le cadre des travaux menés sur le projet européen Autonet 2030 et au sein de la Chaire Drive for All. The move towards automated driving is gaining impetus recently. This paper follows the approach of combining theoretical analysis with practical issues. It gives an insight of some practical problems that are encountered when running automated vehicles in real environments, using intersection crossing as a major example. The aim is not to try to be exhaustive but to show some criteria (safety, efficiency, reactivity, resilience, scalability…) for decision making in automated driving that have to be balanced before any mass deployment. In a second part we introduce mathematical tools that can help define algorithms and systems that improve current state of the art. We will also show some perspective for accommodating the hypotheses of these mathematical tools with real life constraints.